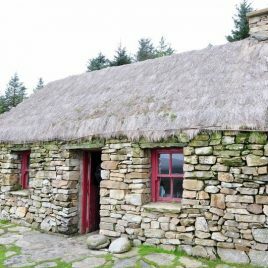 This award winning heritage centre is situated on the N59 approximately 5 miles from Clifden-the capital of Connemara. It offers a unique insight into the history and heritage of this most beautiful part of the West of Ireland. History presentation ‘Connemara through the ages’ in Irish and English. Audio visual available in English, Irish, German and French. Craft shop with a large selection of knitwear, marble, jewelry and other gifts to choose from. Open from April to October. Off season on request.